Tet., Dormant, Mid-Late season, 28" scapes, 6 1/2" blooms, 3-way branching, 16 buds. Yodelayheehoo is a lemon yellow with great teeth! I have gotten some interesting seedlings from it. A happy addition to the garden! 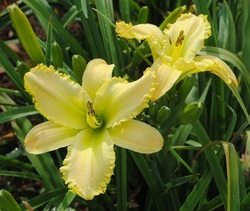 Tet., Dormant, Midseason, 25" scapes, 6 1/4" blooms, 5-way branching, 32 buds. 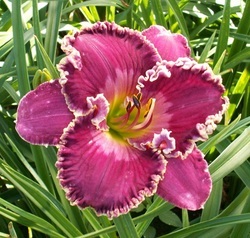 Hide Your Crazy is a lavender rose with a slightly darker eye. 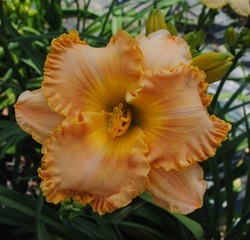 Large ruffles surround this bloom. 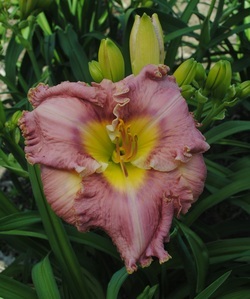 Strong scapes and flowers with great substance leave these blooms looking gorgeous after a rain. The eye does change its darkness throughout the season. Tet., Dormant, Early-Mid season, 35" scapes, 5" blooms, 3-way branching, 18 buds. 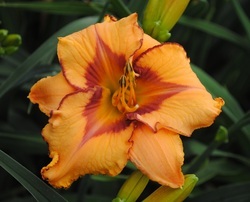 Chunky Monkey is apricot with a light maroon eye. It also has a knobby, gold metallic edge. 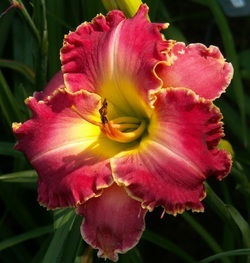 The eye and edge tends to vary in its darkness throughout the season. Fantastic parent plant and sets pods well. The tall scapes are so very important in my breeding program. 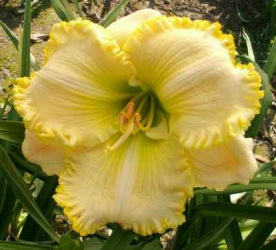 KaChigga is a creamy yellow with a green throat and a golden yellow tightly ruffled edge. Tet., Semi-Evergreen, Mid-season, 28" scapes, 5 1/2" blooms, 3-way branching, 18 buds. 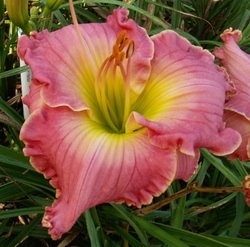 Hopper Roo is a medium plum with a lighter lavender watermark, green throat and a white edge. Tet., Semi-Evergreen, Mid-season, 29" scapes, 5 1/2" blooms, 3-way branching, 20 buds. Chicken On A Chain is peach with a plum eye and plum wire edge. white mid-ribs and a wire gold edge.